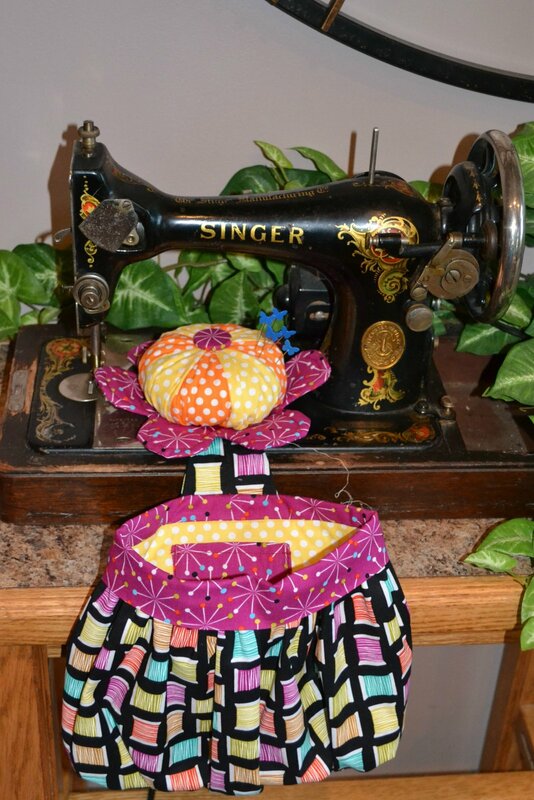 This kit is for a flower-shaped pincushion with attached scrap bag by Abbey Lane Quilts. This kit uses fabrics from the Love to Sew collection by Michael Miller Fabrics. Make one to use by the your sewing machine, one by your cutting table, one by your favorite chair for hand stitching, and one for your quilting friend. Kit includes all fabrics needed plus the fusible fleece, coverable button, and the shelf liner. SPECIAL OFFER FOR LIMITED TIME: Purchase one or more additional Abbey Bag kits without the pattern for $ 16.00 each, and we will send you enough crushed walnut shells for filler for all the pincushions for FREE!